As Godzilla rips through the box office, he’s also tearing up the courtroom. Toho Co., the Tokyo-based company that first trademarked Godzilla in 1954, has filed over 30 copyright and trademark lawsuits, warning letters, and complaints against the unlawful use of its character since 1991. As promotion for the newest Godzilla movie heated up, Toho granted permission to brands like Snickers for advertising campaigns, but those who haven’t received Toho’s stamp of approval have certainly paid the price. Ever heard that Blue Oyster Cult song “Godzilla?” Probably not, but in the 70s, the band had to pay an undisclosed amount in licensing fees to Toho. And if you thought about enjoying a nice glass of cabernet with Godzilla’s face on the bottle, think again. 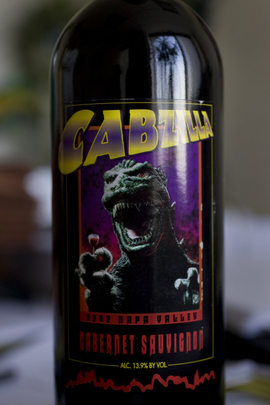 In 2002, Toho forced Adler Fels Winery in Napa Valley to destroy its entire inventory of “Cabzilla” wine in a legal settlement for unlawfully reproducing the lizard’s image. The legal action may seem over-the-top, but Toho’s attorneys carefully weigh which lawsuits to file. In an interview with Newsday, Larry Iser, partner at Kinsella Weitzman Iser Kump & Aldisert, said, “When you have something as famous as Barbie or as Godzilla, you’re well-served to protect that.” Even a gargantuan lizard that stomps on cities still needs a good lawyer. For us freelancers who can’t afford law firms with five name partners, how can we protect our content? If an unauthorized source reproduces your words, photos, or graphics, that could mean less traffic for your site, less recognition, and less revenue. 1. Put a copyright symbol on all pages of your website and any other content you create. Not all marks need to be federally registered, but letting the government protect your work definitely has its perks. (Note: Deciding between registering a trademark and a copyright can be confusing. For help distinguishing the two, check out Legalzoom). 2. Use a content checker to search for copies of your webpages on other sites. Try Copyscape, which will help you find versions of your content anywhere on the web for free just by typing in the URL. Or use Plagspotter, which has a very handy batch search feature for finding duplicates. And if you don’t have time to constantly check for plagiarism, you could subscribe to premium services like Copysentry that routinely scan for copied content and send alerts. If you’re a graphic designer or illustrator, try a reverse image search on Google or Tineye, which will help you find out where an image came from, how it’s being used, and if modified versions exist. 3. If you use WordPress, the WP-Copyprotect plug-in will ‘lock’ your blog so text and images can’t be highlighted, copied, and pasted. Screenshots or re-typing content will still be possible, but plagiarizers are, by nature, not exactly the most motivated bunch to overcome roadblocks. 4. A Creative Commons license is an easy way to protect content from misuse. A CC license is used when an author wants to give people the right to share, use, and build upon a work they have created as long as they credit the original. If these steps don’t work and you still suspect someone has ripped off your content, kindly ask the perpetrator to take it down before you go to a lawyer—there’s a good chance he or she will comply. And if you happen to quote someone else’s work, follow the words of Ice Cube: “Check yo’self before you wreck yourself” and attribute, just like I did here. If you’re reusing work from a writer, artist, or washed-up rapper, chances are that person will appreciate the shoutout.